We’ve owned our house for 17 years and I swear, every time we walk by our front porch, we say “We need to do something with this area! We need to turn it into a chat corner.” The vision came easy because it’s the perfect outdoor gathering space. It’s covered, and pretty much clutter-free. But no, we just walked by and dreamed. 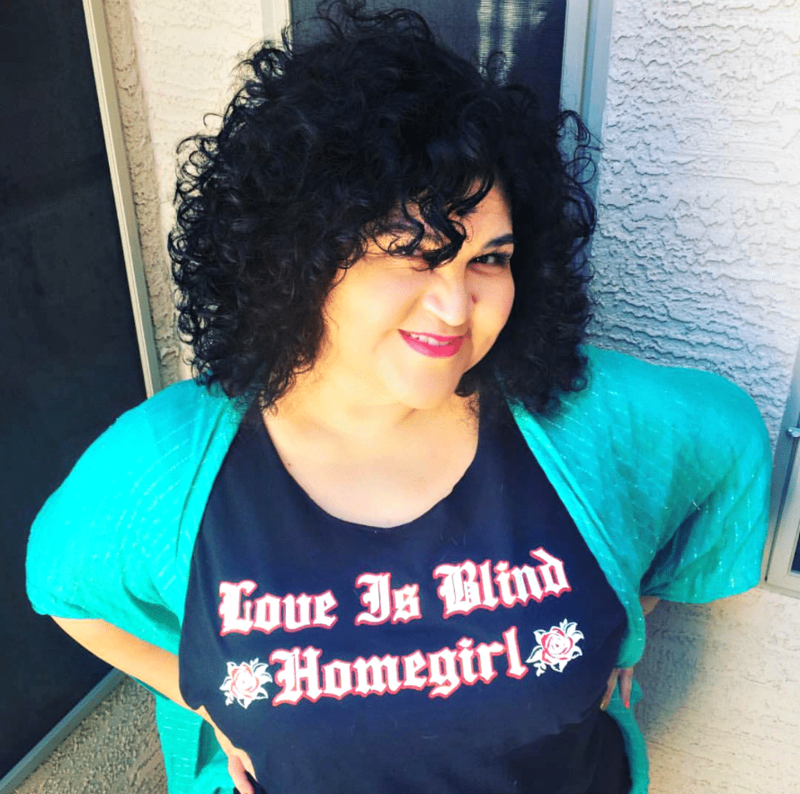 Now that I’m an official Lowe’s Creative Influencer (YAY!! 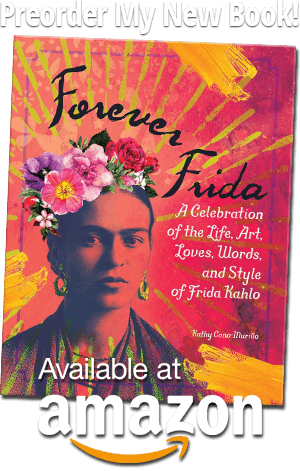 ), we can dedicate time and energy to giving some love to spaces like this. 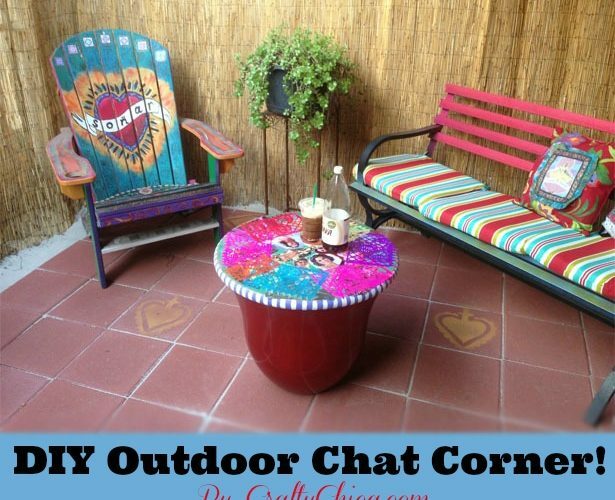 First on the agenda – the DIY Patio Chat Corner. 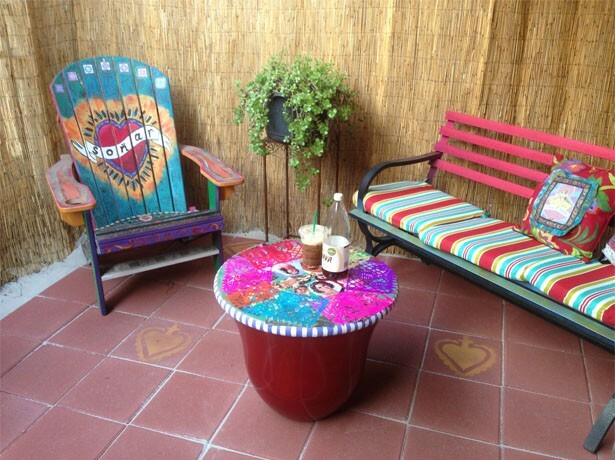 Essentially it’s a mini-makeover for an area of your patio. You don’t have to revamp the entire area, just a corner. 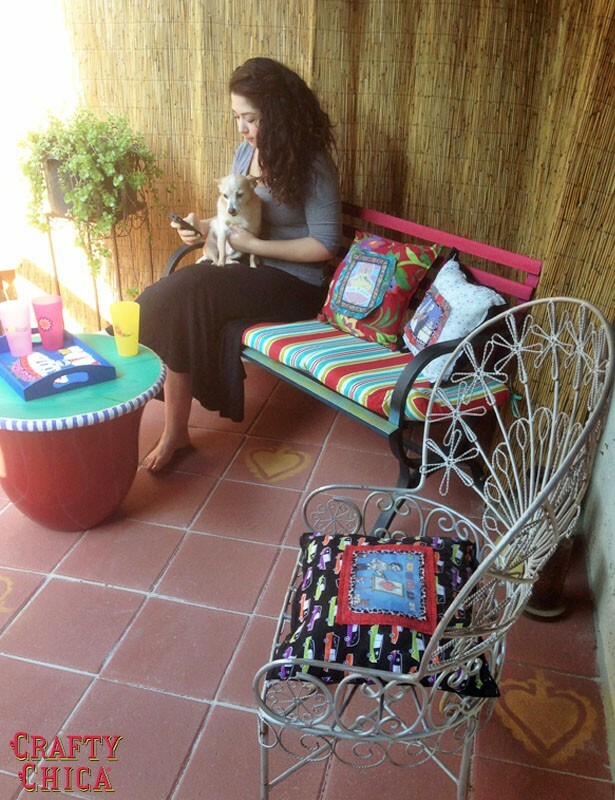 Make this a cozy patio chat corner for you and your friends or kids to hang out. I converted this entire space for about $300. The biggest cost was the concrete square floor. If you already have cement, you can skip that part! Before pictures. Dull, dry, uninviting. See why we wanted to make it over? 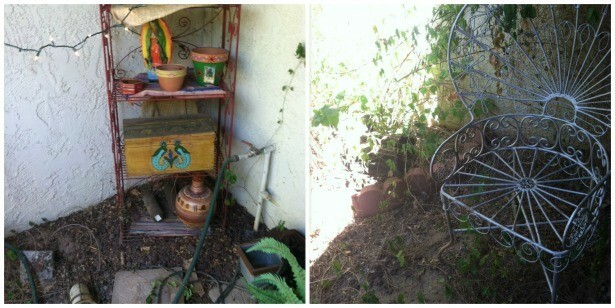 Here are some awkward “before” pictures of our front patio. We had a chair there, but the space sure wasn’t chat-friendly! Honestly, we never snapped photos because there was nothing worthy here. NOTE: I already had an Adirondack chair that I painted, but Lowe’s has several versions you can buy and paint and seal! 1. Clear the area, smooth out the dirt, and use concrete squares to create a hearty foundation. This is really what gave this space a whole new look! To start, measure how large your space is and buy the squares (Lowe’s can also deliver for you!). Pour out a smooth layer of the sand and level it as much as you can. 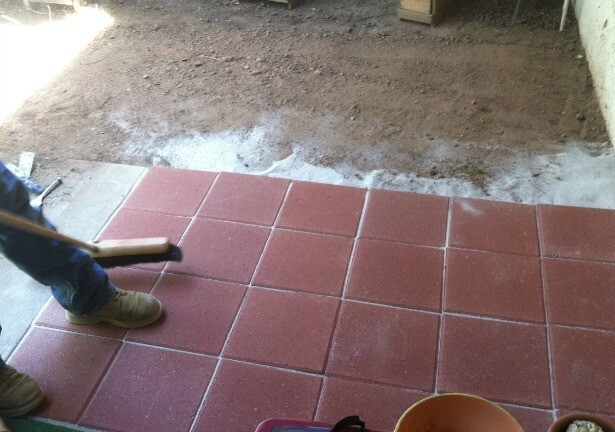 Set the tiles on the sand in an even row and use the mallet to tap them tightly together so they all line up. This takes a little bit of extra work, but it’s worth it because it will look very polished and professional! 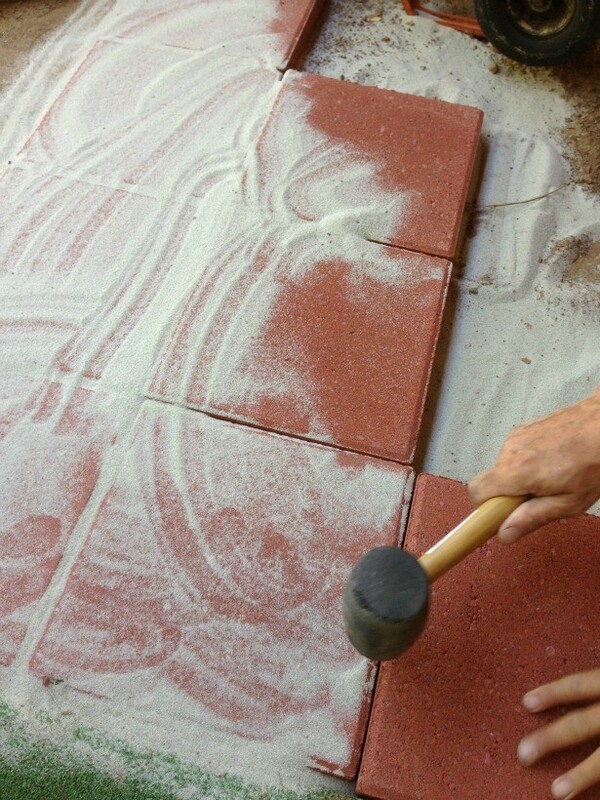 Use a mallet to tap the tiles close together, keep sweeping the sand over the grooves to fill in. 2. Keep sweeping the sand over the squares so the grooves are filled nice and tight. 3. 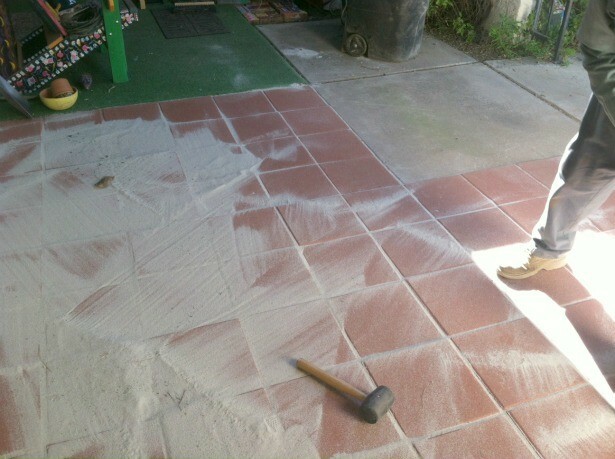 Once it’s done, sweep away the excess sand. You can also wet the entire area so the sand will firm up in the grooves. Add a reed fence for backing. I also bought a sturdy $98 metal bench and painted it! Added seat cushions and pillows too! 4. Next, we needed to brighten up the metal bench. 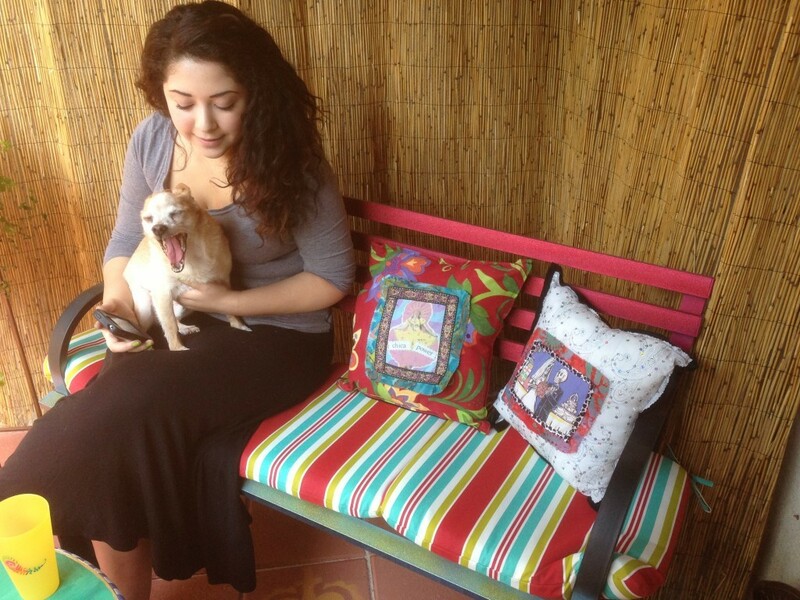 I used red and green spray paint and added some colorful cushions. We also set up the reed fence. The bench and the fence are my faves. They give the space warmth and personality. 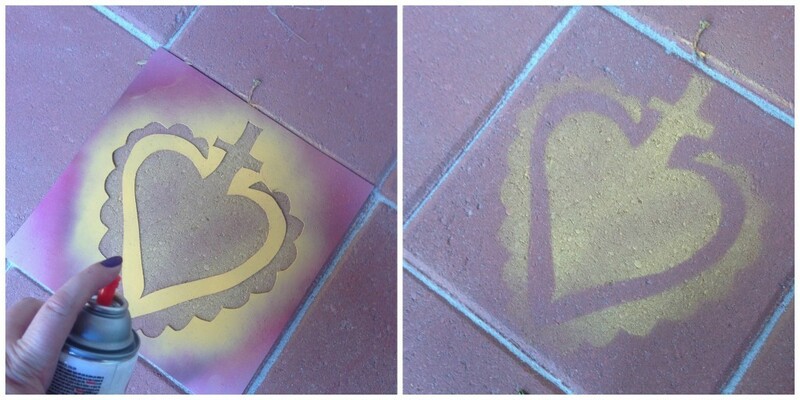 I couldn’t help but stencil the concrete squares! 5. Speaking of personality…after we put up the fence and added the table (separate project coming soon! ), I felt like the concrete squares needed some “pop.” I used one of my hand cut stencils and spray paint to add random designs. Maybe later I’ll add more, but for right now, yellow worked perfectly. Finished look. Ready for some chatty action! 6. Fill in with accessories and other furniture pieces. I pulled two chairs I had in other areas and they fit perfect. I also used some pillows that I made recently! Final look! i L-O-V-E it! I bought most of it at Lowe’s! 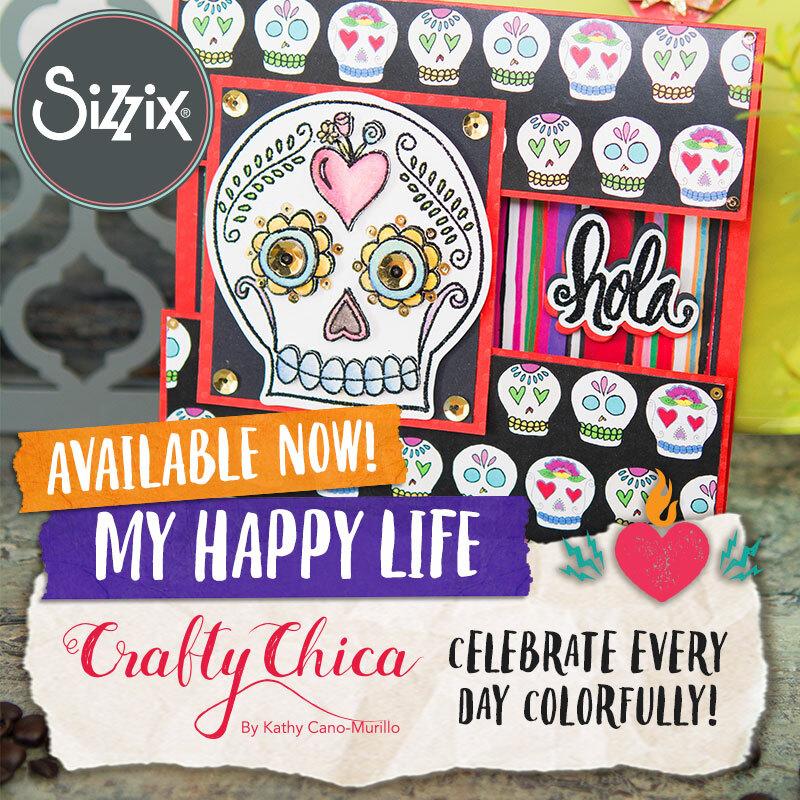 The result is a fun, summery patio chat center that is fresh, cool, and has a touch of Latin-style! Previous Article6 Weekend DIY Ideas! where can i purchase the stencils?